I think this is the first look I've seen using the shorts/tights combo that actually works! Bravo Melissa!!! I loved it all, you are pure inspiration! Come to SPFW with me! Big kiss from down the tropics. So Nigel - This may come off sounding a little weird and that said, taking that risk, here I go here I go here I go. The vivid arresting quality of the colors in these shots makes me think of the idea of multiculturalism and how it has and continues to shape North American culture. Sure - clothing is what is represented here but the color of skin, the golden color of the buttons and the ring - the purples in the lipstick and that winning orange all citrus'y and 'everything'. Right down to the brown in the shoes. The flower near the woman in the background with the brownish purse and the posters on the pole all next to the suspended street light just off-set from your subject's face. Orange, brown and gold - maybe the new colors of an all North American flag. This is how we look now! Intentional or not it is brilliance. Intentional or not multiculturalism breeds brilliance. I have said it before - you make Toronto shine. It co-stars in your stories, integral and unique. Fantastic combination of color and style. This girl ROCKS! Hey Melissa - Just sayin' I can diggit! Jdit: Once again your attention to detail impresses me. Indeed, the way you tell a story through my photos motivates me to continue shooting street style. Toronto is a beautiful mosaic and I want that to show in my photography. 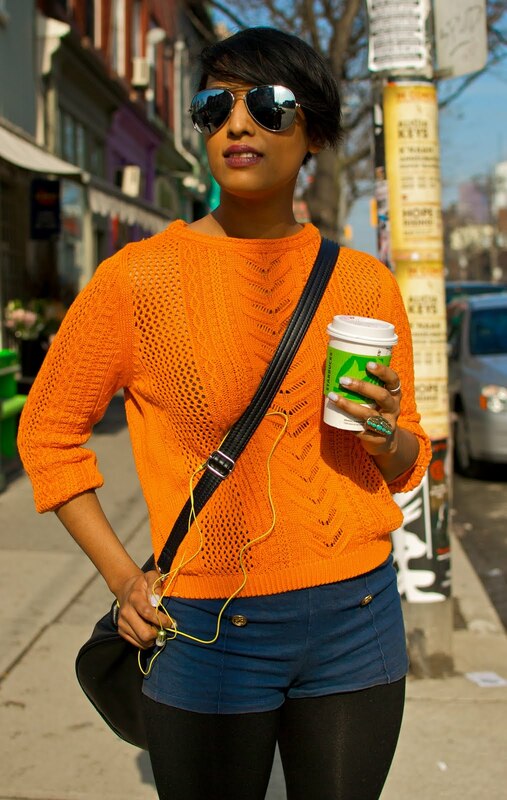 I'm always in the pursuit of bright colours in the streets and seeing Melissa in this brilliant orange quickly caught my eye. Of course, I'm always mindful of my subjects' time, so I spent mere seconds shooting her, but it wasn't until afterwards that I was mesmerized by the same details you outlined. Thanks for noticing. Incidentally, last night Dorothy and I saw "Bill Cunningham New York", a documentary chronicling the extraordinary life work of the original Sartorialist. It gave me greater appreciation for what I am doing. Thank you, Mr. Cunningham for inspiring Street Style photographers around the Globe. I have not yet had a chance to see the Cunningham documentary but will - I am a massive fan of his work. I follow his stuff in the NYTs religiously. It is easy for me to tell the stories I see in your pictures because they do capture so much. I think you may well transcend mere street style. Along with your unquestionable fashion and style sensibilities there is an element of cultural photo journalism. It is engaging and captivating. Continued great work! Toronto is greater having you to put it in pictures. jdit - I'm so happy you can diggit!!! LOL I'm happy I'm becoming a stylist.